Großer kostenloser Parkplatz am Strand, nachts war es einigermaßen ruhig. Öffentliche Toiletten und Duschen geöffnet von 9.30-20 Uhr, duschen kostet O,30£. This place is fine to stay overnight. the street cleaning is rare (I'm local) if you go further down to the bottom and left the ground is leveled out there... and the men's toilets are on the other end of the village next to the restaurant 'la terraza'. in summer the facilities are open til 7pm at least. Not recommended!!! Sloping, parking beside a tip/quarry, shower is for ladies only and was locked . 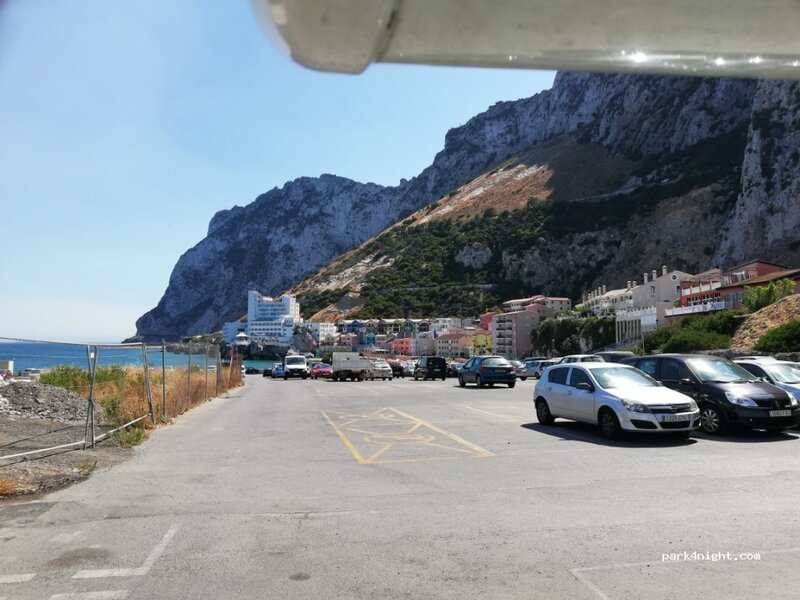 The photo shows A lovely view however when you look behind you there is the quarry/dump and a storage facility for vans and trucks, it also took 25 minutes to walk to town down through Gibraltar’s industrial area. Es ist ein großer Parkplatz mit traumhaften Blick auf den Berg und die EastSide. Wir haben dort ohne Probleme schlafen können, es war sehr ruhig. Wir hatten sogar W-Lan vom La Mamela. Für eine Nacht oder länger in Gibraltar würde ich diesen Parkplatz wieder wählen! Not the most beautiful place to stay, but the night was more or less quiet (I sleep with "ohropax"), public toilets and shower open from 9.30-20. Shower costs 30 pence. No problems with police. Large spaces by the tip sign says no parking over night except bank holidays. Parking Balona football field, in front of the beach and 200 m from the border.